Derrick Johnson picked up right where he left off in week 7, with 13 total tackles, a sack, an INT, and a pass deflection. As the Chiefs continue to win and improve, Johnson's play seems to become more motivated as well. If he's on your waiver wire, go grab him. He's back on the LB1 track. The never-aging one, London Fletcher, played through a hamstring injury to record 20 tackles and is on pace to finish the year with the fantasy numbers he typically produces. I've been preaching patience with LFB all season as he was a victim of low tackle opportunity through the 1st few games of the 2011 season which were resulting in his below average tackle numbers. Hopefully you held onto him. The Indianapolis Colts continue to be a horrific matchup for IDPs. 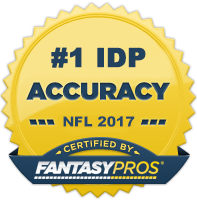 I would recommend benching all but the elite, matchup independent IDPs against them moving forward. Both Justin Tuck and Trent Cole returned to action and both got to the quarterback. Cole saw more snaps than Tuck did (partly due to health, partly due to natural team rotation). I'd trust Cole as a DL1 moving forward and Tuck as a high upside DL2+ until he sees more snaps. Jerod Mayo was another IDP superstar that returned to the playing field in week 8. However, his snaps were quite limited as he rotated with Gary Guyton throughout the majority of the game. He's not startable in most leagues until we get an idea on when he will return to full-time status. He's definitely worth a spot on your bench though as there's little doubt he will be back to playing all three downs by the time the fantasy playoffs crank up. Sean Lee left Sunday Night's game with a dislocated wrist and did not return. There's no word yet on whether or not Lee will miss any time. Being a diehard Cowboys fan however, I can pretty much assure you he will be starting come gametime next week. The Cowboys and Rob Ryan know they will have a hard time beating anyone with old and decrepit Keith Brooking at linebacker. Chad Greenway continued his recent streak of top notch fantasy performances. With EJ Henderson appearing to have lost a step, Greenway has a clear path to once again be a top 10 linebacker in tackle-heavy leagues. RDE Chris Long (STL) - Long is a lineman that is constantly around the quarterback but at times has a hard time translating those QB hurries/hits into sacks. This wasn't the case in the Rams game last Sunday against the Saints, however, as Long racked up 3 sacks against a typically strong pass-protecting New Orleans offensive line. Chris "Don't Call Me Howie" Long gets a juicy matchup against the sputtering Cardinals offense led by quarterback Kevin Kolb who is notorious for holding onto the ball too long. Don't be shocked if Long has another multiple sack game this week. RDT Richard Seymour (OAK) - Since Tim Tebow took over the starting quarterback duties in two weeks ago, the Broncos have been sacked an astonishing 13 times. As long as Tebow continues to take the snaps under center, I'll be looking to start any viable fantasy defensive linemen that is facing the Broncos that specific week. Not only does Tebow have no idea how to read a defense leading him to hold onto the ball too long, he also does a horrible job of protecting the football, as we saw last week. Although he's cooled off a bit of late, Seymour has the potential for a huge game this week. RDE Darnell Dockett (ARI) - I typically don't recommend defensive ends who only have 0.5 sacks on the year after 7 games of play, but Dockett has been a solid DL2/3 option for four years running and is due for a good fantasy game. He faces the much maligned Rams offensive line this week which should give him just the spark he needs to get his fantasy numbers more in line with his typical production. If Calais Campbell is available, start him over Dockett. However, in deeper leagues, Dockett may be your only option of the two. LDE/LOLB Aldon Smith (SF) - Smith leads all rookies with 6.5 sacks (all of them coming in the last 4 games). His limited snap count is hurting his overall tackle numbers, but is also keeping him fresh to get to the QB late in games. Due to the low tackle numbers, he's a risky LB3 option in most weeks, but is a solid DL2+ in leagues that allow you to play him as such. The 49ers are traveling to Washington this week to face a Redskins team that was totally dominated by the Bills upfront last week as they surrendered a whopping 9 sacks. Feel free to rely on Smith as a high upside DL2, solid LB3 start this week. WLB Chris Chamberlain (STL) - Chamberlain has been starting on the weakside over veteran Brady Poppinga the last three weeks and has put up 14 solo tackles during that span. Although these aren't great numbers, Chamberlain faces an Arizona team that gives up a ton of sacks to linebackers and issues a surprising amount of tackle opportunity. He still remains more of a LB4 type start, but can be used as an LB3 for teams in deeper leagues that are really desperate to fill that spot this week. WILB Lawrence Timmons (PIT) - Let me start by saying this: Timmons has been absolutely terrible this season from a fantasy perspective. However, he's still an extremely gifted LB with huge upside. Much of his maladies can be attributed to poor defensive line play and injuries among the linebacking core that have forced him to play out of position. It looks as though James Harrison is planning on returning in week 12 at which time Timmons will move back into his more natural WILB position which should provide a much needed boost to his fantasy numbers. The Steelers still have some issues up front defensively, but Timmons is a good enough player to overcome some of that. I'm not saying he's going to be the Timmons of old, but he's certainly worth a stash in deeper leagues if you have the room in case he decides to blow up down the playoff run stretch. WILB Daryl Washington (ARI) - Washington hasn't quite lived up to his preseason fantasy hype, but he hasn't been all that bad either. When healthy, he can be counted on for 6-7 solos and although the Rams may not seem like a good matchup for linebackers, they actually are due to the high amount of carries SJax receives on a weekly basis. Washington is available in more leagues than one would expect. He will serve you well if you need a LB3 this week. MLB Brandon Spikes (NE) - Spikes posted a very nice 10-2 stat line last week against the Steelers and has averaged close to 9 total tackles per game over his last three games. With Jerod Mayo rotating with Gary Guyton, Spikes was on the field for an above average amount of snaps. It's yet to be determined if this will be the case again this week, but it's a situation to closely monitor throughout the rest of the week. Although the Giants aren't a very good matchup for opposing fantasy LBs, the Patriots seem to be playing more 4-3 as of late which should benefit Spikes. If Mayo is again limited this week, consider Spikes a very solid LB3 start. LDE/LOLB Jarrett Johnson (BAL) - Johnson tends to score the bulk of his fantasy points in streaks and he's on a current hot streak of late with 18 total tackles, 2 sacks, and a forced fumble over his last three games. He has a nice matchup against tough division rival, the Pittsburgh Steelers. If your league's IDP scoring system rewards heavily for big plays, Johnson is a good option as your 3rd linebacker. He's a solid DL2 start this week in leagues that classify him as such. SS Darian Stewart (STL) - Stewart was mentioned last week as a very nice weekly pickup against the fantasy friendly New Orleans Saints offense and he rewarded owners who picked him up with 6 solo tackles and an interception for a touchdown. His performance last week should be good enough to cement him into the starting strong safety role in St. Louis which is/has been a lucrative position from a fantasy perspective. Stewart should be a solid DB3 moving forward. LCB Ronde Barber (TB) - Barber isn't the shutdown corner he used to be, but he is still a solid tackler. The Saints are going to come out blazing at home against the Bucs and Barber should receive plenty of tackle opportunity as Brees will likely look his way more often that shutdown corner Aqib Talib. He's put up 4 or more solos in five of seven games so far this season and is a good bet for 6-8 solos this week. LCB Josh Gordy (STL) - The Rams have been absolutely decimated by injuries at the cornerback position which has turned undraft free agent Gordy into a starting NFL cornerback. He's had 13 total tackles in two games to go along with an interception and a pass deflection. His matchup isn't ideal, but somebody has to cover Larry Fitzgerald. My gut is telling me Gordy either racks up a good amount of tackles in this one or he picks off one of Kevin Kolb's crappy passes. He's worth a flier as a CB2. FS Tanard Jackson (TB) - Jackson has had an interception in each of his first two games back from suspension and is usually good for 4-6 solos each week. He did injure himself in week 7, but should be able to go this week as he had the bye week to recover. He's a fairly safe DB3 option with nice upside moving forward. He has a great matchup this week against the Saints and should be considered a solid DB2 play.